Tony Abbott calls for an end to disunity and uncertainty after surviving a challenge to his leadership. Tony Abbott has survived an attempt to remove him as Prime Minister, with Liberal MPs rejecting a push by rebel MPs to oust him by 61 votes to 39, which he likened to a "near death experience". The result was announced by the government's Chief Whip Philip Ruddock, who told reporters gathered outside the Liberal party room that the Prime Minister was addressing his MPs after the vote. Several sources told Fairfax Media Mr Abbott described the result as a "near death experience" and a "shot across the bow", and promised to consult more. "He looked shell-shocked," said one Liberal. In a statement to camera Mr Abbott declared that the matter was now resolved. "The Liberal Party has dealt with the spill motion and now this matter is behind us," he said. "I love this country, I will do my best to help our country to succeed," he said. Mr Abbott was due to speak to the media before question time at 2pm. Several MPs expressed disappointment that the Prime Minister did not make any concessions regarding his controversial chief of staff Peta Credlin, whom many MPs want removed. "It doesn't mean jack if his office doesn't change," said one MP immediately after the meeting. "[Credlin] has to go," said another. The Liberal MP who moved the spill motion, West Australian Luke Simpkins described the result as a "strong show" but said he was pleased with the Prime Minister's pledges. "I certainly won't be [pushing for leadership change] again," he told Sky News. "Even the people who backed the motion want to give the Prime Minister the opportunity to implement what he said he'd do," Mr Simpkins said. The Member for Brisbane Teresa Gambaro said ""The Prime Minister has indicated that he is willing to change and involve the backbench in policy making - this is where the Australian people speak to us. Our constituents deserve to be heard." Queensland Liberal MP Ross Vasta, whose wife recently gave birth, was absent from the meeting and one unknown MP voted informally. The party room, which met in a special meeting on Monday at 9am, took just minutes to resolve a spill motion but the result was much closer than the 30 votes in favour that had been predicted ahead of the spill. While Mr Abbott remains Prime Minister he faces a bitterly divided party room, with Liberal senator Cory Bernardi lashing out at plotters trying to undermine Mr Abbott and calling on Malcolm Turnbull and other ministerial plotters to resign from cabinet. Mr Turnbull has never stated he would run for the leadership, although those working against the Prime Minister have rallying around the former Liberal leader. Mr Turnbull entered the party room meeting alone. Arthur Sinodinos, the most senior Liberal to declare his support for the spill motion, walked in with cabinet minister Scott Morrison. 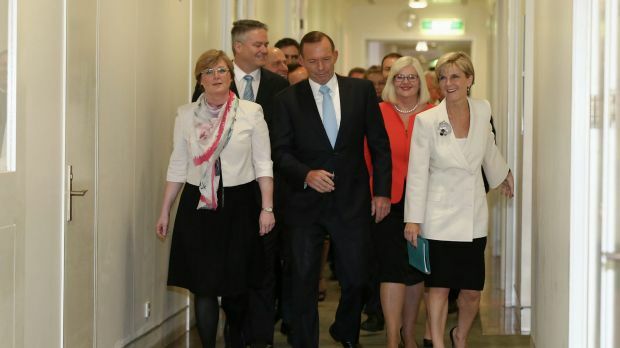 The other often touted leadership candidate Julie Bishop who, like Mr Turnbull, has never stated she would contest the position, entered the party room alongside Mr Abbott. 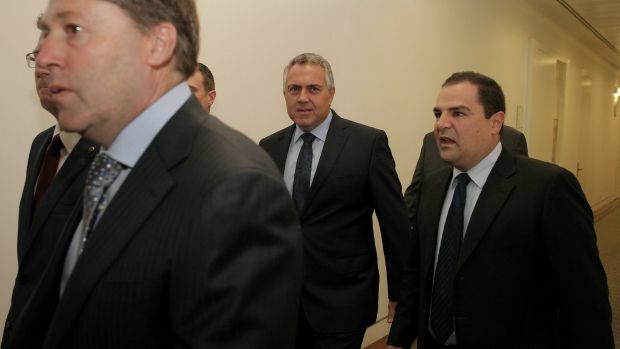 The Prime Minister was flanked by a throng of ministers and backbenchers, including Finance Minister Mathias Cormann, Education Minister Christopher Pyne and Treasurer Joe Hockey. Ahead of the meeting, dissidents pushing for change warned they would not be deterred by an initial defeat. West Australian backbencher Don Randall seconded the motion put by Luke Simpkins to spill the leader and deputy positions. 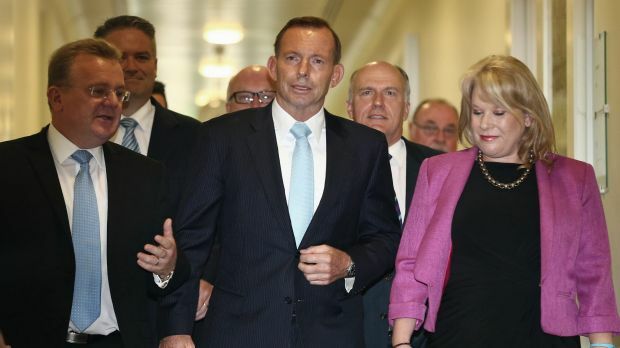 Mr Abbott made a point of approaching the pair in the party room before the ballot was counted. Arriving in Canberra for the resumption of Parliament for the year, Mr Randall said "no matter what happens … I suspect this is just the beginning of a process where we have to sort it out once and for all". Newspoll results published by News Corp publications on Monday show Mr Abbott's approval rating has plunged to minus 44, with just 24 per cent of voters satisfied with his performance, compared with 68 per cent who are dissatisfied. 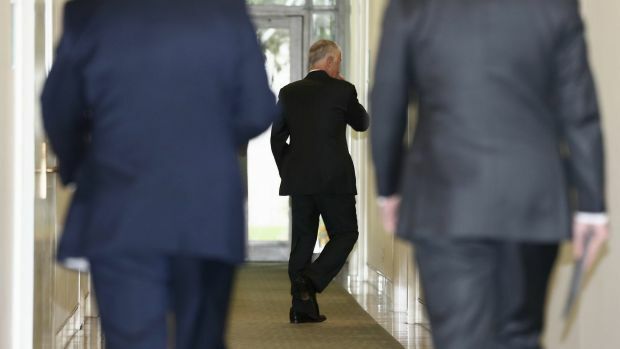 About 64 per cent of the 1178 voters surveyed said they preferred Mr Turnbull to lead the Liberal Party compared with 25 per cent who said they preferred Mr Abbott. It is also expected Mr Abbott could face a second push to remove him from office. Tony Abbott might have survived the party vote that was not a vote of confidence. The ratio of those votes shows a similar party dissatisfaction and unfortunately, the Australian Public are totally unaware of the incredible incompetence and stupidity of Tony Abbott that has NOT been made public. The public seems to be blaming Peta Credlin when is is obvious to any intelligent reader that she has probably singlehandedly save Tony Abbott's bacon so many times that its one reason why he cannot and should not dispense with her services unless of course, he made an intelligent decision and had her take over a safe Liberal seat to give her a more legitimate position in parliament. One only has to look at the body language of Tony Abbott and it speaks volumes of a delusional mad monk who has developed the mentality that he can dispense words and have the public and or his entire party believe it is god talking. When it comes to Julie Bishop, the Australia Public are unaware of her failure to express any concern to the Canadian Government when a string of public officials in Ottawa all Fabricated Evidence to unfairly incarcerate an Australian child. Julie Bishop is an abject failure as a Foreign Minister and if the Liberal party are as aware as this writer then hopefully she will be removed as Foreign Minister for Australia.